The Sogetsu Study Group met after the summer on July 17th at ABK's Yamamoto Hall. We all settled down to the business of the day, after excited greetings and stories of our respsective summers. Before we got into the much awaited demonstration, we finished with the other Study Group agenda. New office bearers were introduced, thanking the outgoing office bearers who did very good work in the previous years. Malathi attended the Bengaluru Sogetsu meeting and briefed the members of their programme. Janaki was handed over her certificate that she received. New members were introduced and welcomed into the Study Group. Then it was time for the demonstration. Our Study Group member, S Venkatesh gace a talk and demonstration titled " Bharatanatyam and Ikebana- some parallels in techniques, while expressing the art". Venkatesh is a student of Sogetsu Ikebana and a teacher of Bharatanatyam, and drew parallels in line, movement and balance. 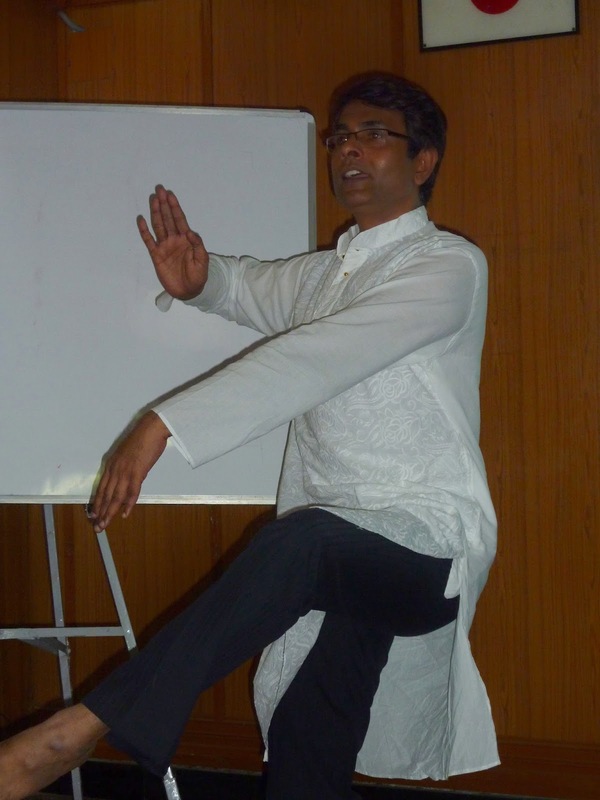 He first spoke about nritta, which is the aspect of movement and posture in bharatanatyam. Look at the beautiful lines that the movements deliver. He then demonstrated abhinaya, and hand mudras, which is the feeling and emotion the dancer brings to the art. Malathi sensei then demonstated how the karanas, or the postures that are famous, can be interpreted via ikebana as well. The dancer uses his/her body, while the Ikebana artist uses plant materials to express "livingness" and " movement", keeping in mind " Line" as a characteristic, as also "angles", " heights" and "proportions". 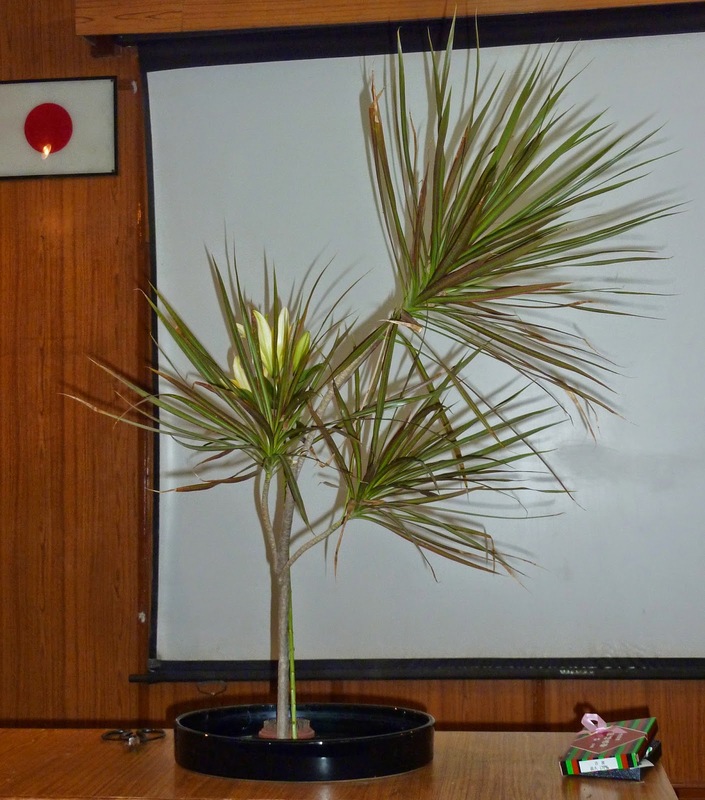 The study Group enjoyed seeing the karanas interepreted through plant material. Adhikraantham karana. Viruchi kareseetham karana translated with variegated dressina. The last piece, was a free interpretation of a group of dancers, represented by the heliconia, with hte mass of lines and colour below representing their dance. The members were excited by this interesting start to the year's programme. An awareness of both forms of art among several members heightened the appreciations as well.